this salad is amazing and is a perfect fit for the holiday season due to the colors and seasonal vegetables being used. if you aren’t a fan of brussel sprouts currently, i encourage you to try this rendition and see if you can be swayed over to the green side. start by cutting off the bottoms of the brussel sprouts and separating the leaves of each one, then throwing into a large bowl. this is a time consuming process so it helps to do it ahead of time or have extra helpers around. 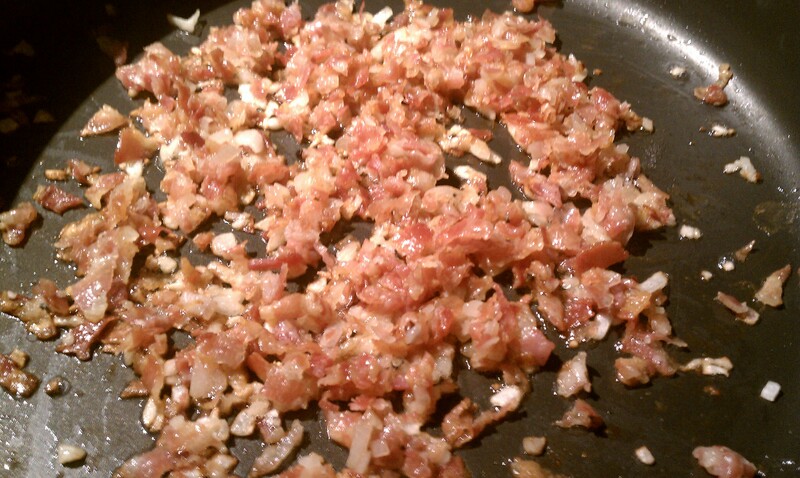 in a large saute pan, cut pancetta into tiny pieces (bits) with cooking scissors and saute with shallots in a small amount of olive oil. 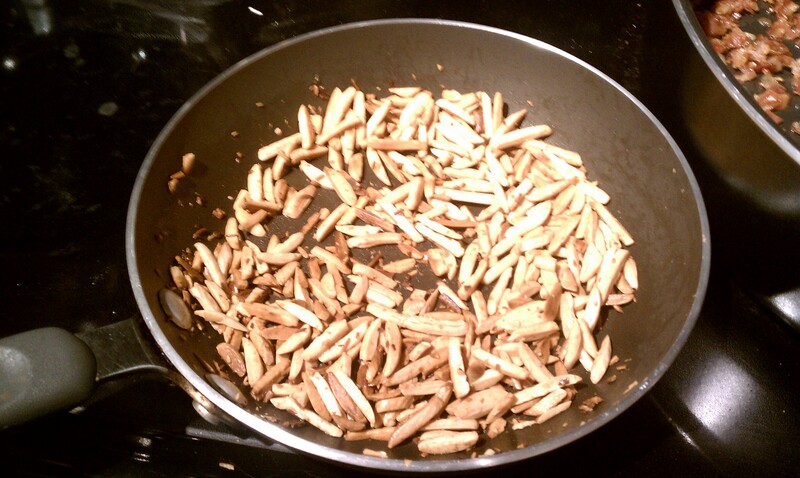 cook until brown and crispy but not burned which should be about 5-10 minutes. drain some of the grease from the pan except for a tbsp so you can continue to use for cooking. in a separate pan toast your almonds by putting them with 1 tbsp of butter on medium heat and stirring consistently for about 5 minutes. they will start to brown quickly. 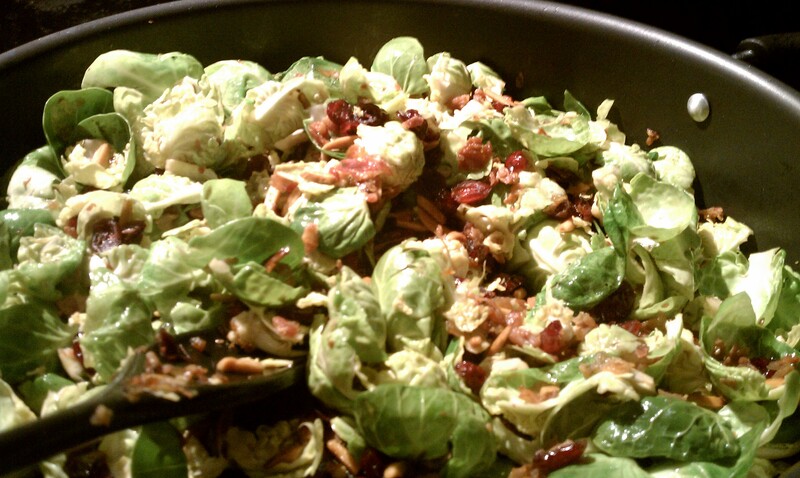 next, combine brussels sprouts, toasted almonds, and cranberries into the pan with the pancetta and stir around for a minute so the leaves get coated with the oil. in a separate bowl combine the chicken stock and balsamic vinegar which will then be poured over the salad. stir all ingredients together consistently for about 3-5 minutes until the brussel sprout leaves get to be a bright green and get softer. 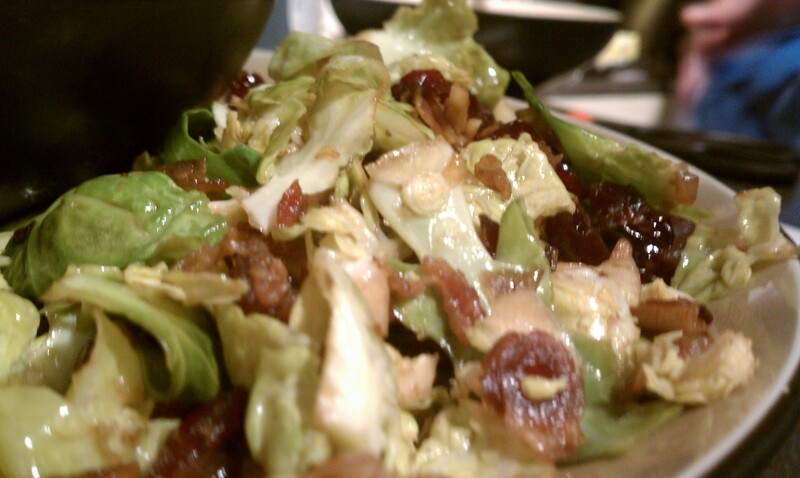 take off heat and salad is ready to serve. 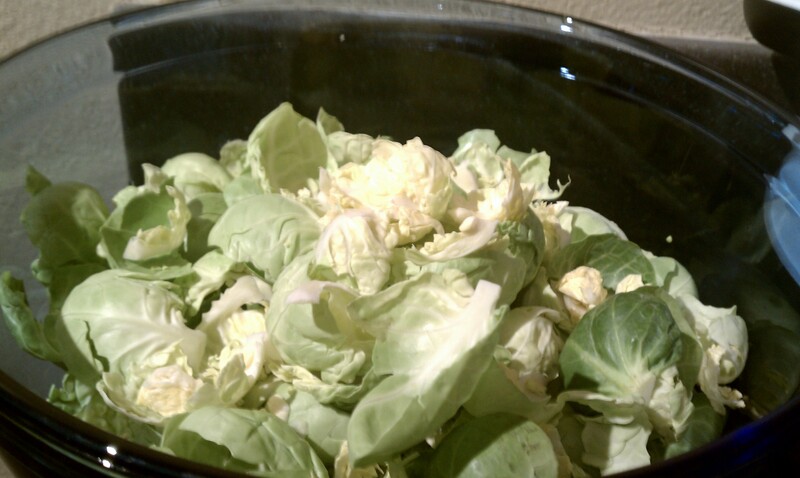 it is a wonderful combination of sweet and salty and adds a fun crispness with the brussels sprouts.